Brothers Christian and Raphael Bender had the kind of childhood most of us dream about. They started out messing around on dirt bikes near Germany’s picturesque Black Forest, and began rebuilding bikes to finance far-flung adventures in the dunes of the Sahara desert. After a successful foray into the business world, the brothers have returned to their roots. 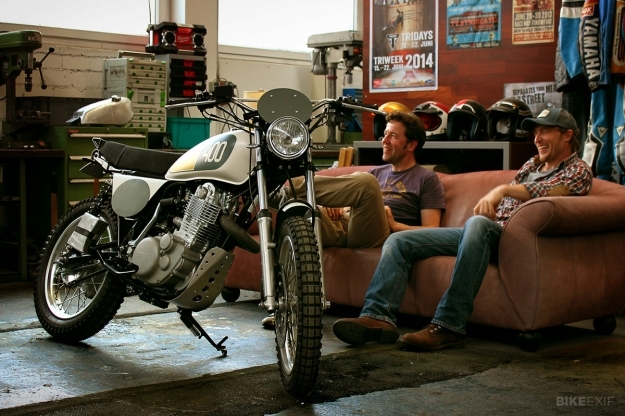 Feeling that something was missing from their lives, they’ve set up Benders, a small workshop in Ettlingen. Their customs have a distinct enduro flavor, and caught the eye of Yamaha Europe. 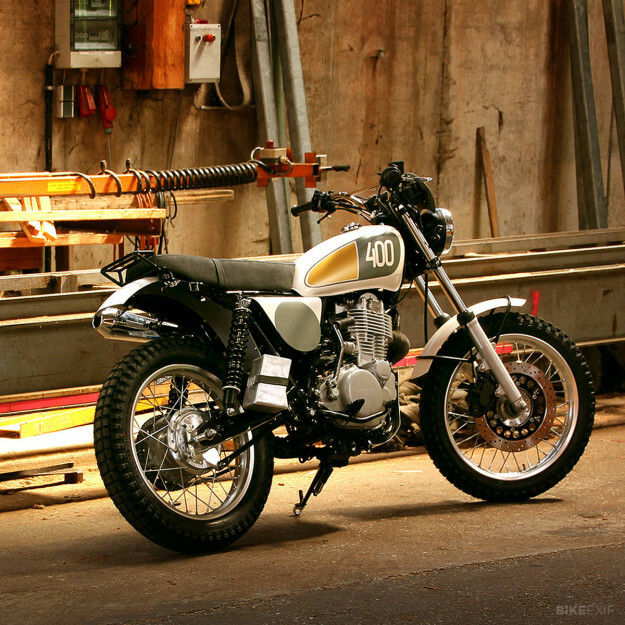 Hence this sharp-looking SR400, the latest addition to Yamaha’s ‘Yard Built’ program. The Benders have a taste for simple, effective machines with real-world usability—like classic XT, SR and XS Yamahas, Triumphs and Betas. 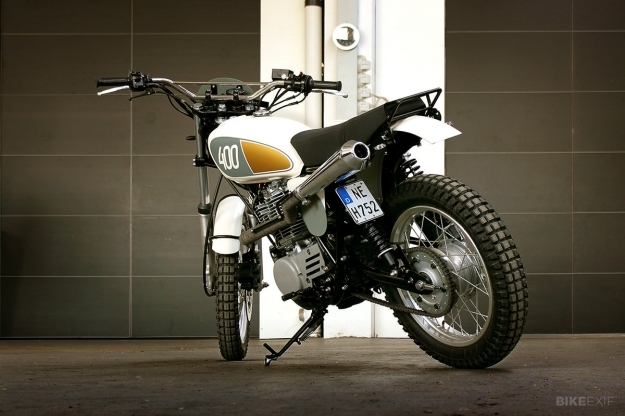 For their Yard Built bike, they’ve captured the vibe of the legendary XT in a modern package. The idea was to keep the approach down to earth—which meant no cuts to the frame, practical functionality, and a starting point for bolt-on custom parts. 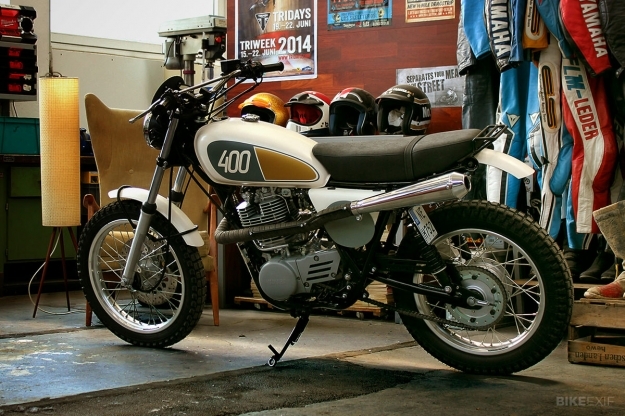 Christian and Raphael had just four weeks to build this clean-looking SR400, nicknamed ‘Homage,’ but you’d never guess. The forks have been extended, and another 30mm added at the back via custom shocks. Custom triple trees accommodate the new geometry and higher ride height, with Heidenau Klassik Enduro tires offering a little more bite on loose surfaces. Other mods include enduro-style footpegs and foot controls, and chrome enduro bars for extra leverage at the helm. The shortened seat is a custom unit, allowing space for a small luggage rack. 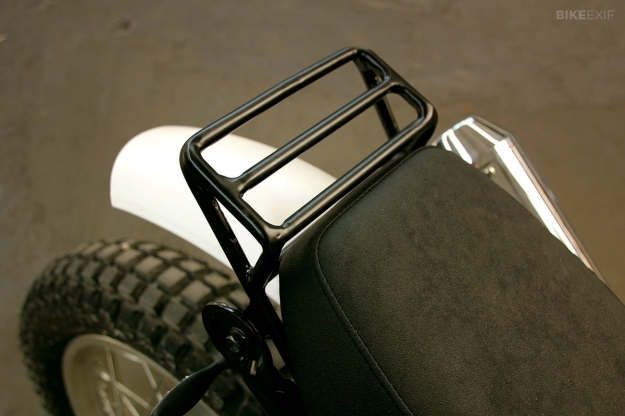 Adding to the vintage enduro vibe are custom aluminum fenders, a custom bash guard for the engine, and new alloy side covers and clear-coated engine cases. 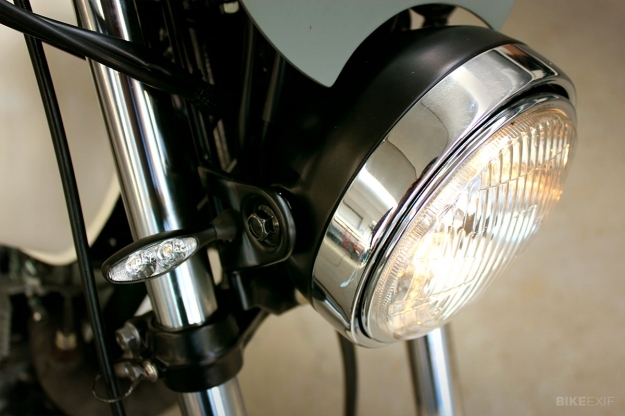 Compact lights, instrumentation and number holders keep the look minimal and functional. It’s all topped off with a vintage TT500-style paint job. Looks like fun, doesn’t it? Images by Sven WDMYR at Wheels of Stil. Check out Christian and Raphael’s other classy builds on the Benders website.